The Biggsd stall has been very kindly invited to attend the Dbarc funday event on the 9th September. We are very pleased to announce that our Annual Funday is booked for 2012. 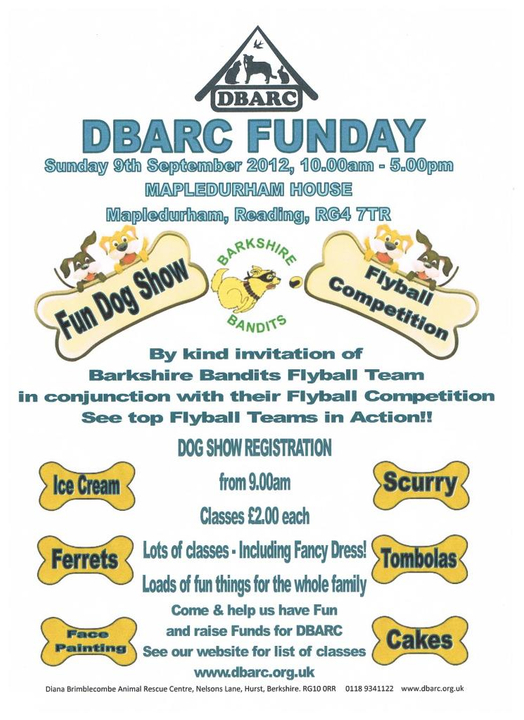 We are very lucky to have secured a venue this year as it was looking doubtfull we would be able to hold our Funday again this year, so we are very grateful to The Barkshire Bandits Flyball Team for allowing us to share the venue they have hired for their Flyball Competition at no cost to us! So not only can you come along with your canine friend and enter him or her into our dog show, but you can also go and watch the amazing and fascinating sport of Flyball which is a wonderful spectator sport! Of course if your dog likes to play ball, why not have a chat with the Barkshire Bandits about becoming a member of their very successful team!! Let's hope we need these 'cos it's a hot day!! You will have seen the competition at the other end of the venue, so you will be keen to see if your dog has got what it takes!! Timed race circuit for your dog to run - winning times win a prize! Will your dog run past various temptations - or will he/she just eat them up?! Get there fast - they are sure to go quickly! Come and meet these adorable little creatures! The kids can have their faces painted to look like various animals! Hook a Duck, Lolly Pick and more! a2bmedics.co.uk - who will have an ambulance on-site, and are very generously giving us first aid cover on the day free of charge! Once again a2bmedics are kindly supporting our event, thank you guys! will be flying over from Ireland to attend & hopefully meet up with some of the dogs they help to save & rehome over here.